Amazon.com description: Product Description: The subtle arts of management and leadership have been developed over thousands of years by the Chinese. 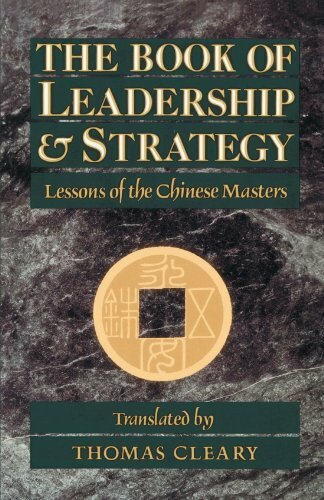 The Book of Leadership and Strategy represents the Taoist culmination of this long tradition and is one of the most prestigious works of ancient Chinese thought. Collected here are insightful teachings on the challenges of leadership on all levels, from organizational management to political statecraft. The translator, Thomas Cleary, has chosen and arranged these teachings to emphasize the most valuable lessons of Taoist wisdom for modern Western readers. Like Cleary's best-selling translation of The Art of War by Sun Tzu, this work will serve as an enlightening guide for people in business, politics, and government. About: The subtle arts of management and leadership have been developed over thousands of years by the Chinese.